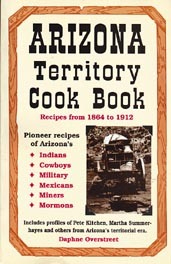 Arizona Territory pioneers prepared their food the hard way! Dutch ovens, open fires, barbecues ... they used many methods to overcome the difficulties of cooking on the trail. Authentic recipes from Indians, cowboys, the military, Mexicans, miners and Mormons. Cut the meat into small cubes. Brown garlic and onion. Add meat and steam. Rub tomatoes through a colander and add to meat. Now stir in chile pulp and cook for 20 minutes. Next, add seasonings and cook for 2 hours. Add cut-up olives last and cook for additional 1/2 hour. Serve with frijoles and tortillas. The spacious mansion of Don Solomon, and especially the very roomy kitchen, was full of women preparing all sorts of things for the coming fiesta of San Juan. Turkeys and chickens were slaughtered and plucked, red pepper was being ground upon two metates at once, dried maize leaves were soaked, stretched and dried to envelop the toothsome tamale; cornmeal cakes were patted flat and fried to assume the beautiful sprinkled appearance of enchiladas, while a professional baker busied himself in the manufacture of biscochuelos and other sweets.